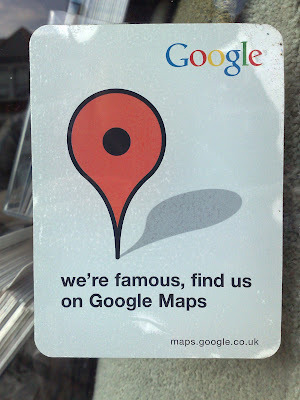 I saw a sticker in a local shop window earlier today saying that the shop is 'famous' because it is on Google Maps. It is rare to see Google using non-digital channels to drive people to Google products. Google have run B2B advertising such as Adwords trial inserts and display pages encouraging Adwords experimentation, but I can't recall any other B2C targeted activity encouraging consumer use of Google products. Ironically (after getting home and opening up Google Maps) I found that the business displaying the sticker isn't actually on Google Maps - other shops in the road are listed, but not the one displaying the sticker! At the same time I also can't help wondering why you would need to look up a shop on Google Maps whilst you are staring into its window???? In this instance the message was obviously a bit lost!